Both quartz and granite counters get a thumbs up from us. Our clients who choose granite over quartz usually do so because they want the natural characteristics of the stone to show, and those who choose quartz do so because it looks like stone and feels like stone, but know that it will be more forgiving in terms of maintenance. Both are good options, and are the most popular countertop choices with our clients, with marble trailing way behind. "Quartz products will be mostly indestructible and are the best surface for worrisome or no-maintenance homeowners", reports Ross Clark, General Manager, "while some clients just love the uniqueness of a natural stone like granite". 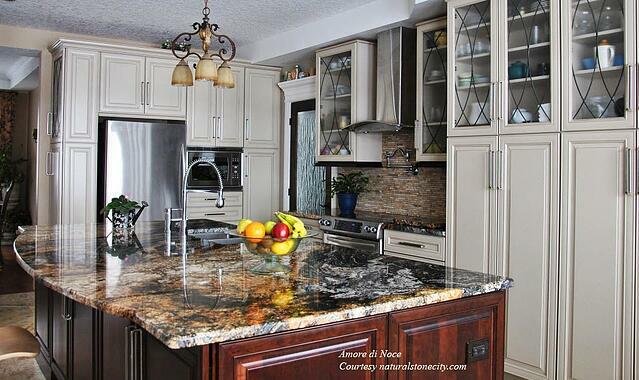 Here's some more in depth information about the ins and outs of granite and quartz counters. 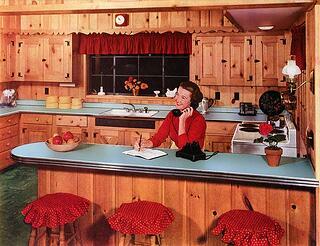 We’ve come a long way since the original Formica countertops were introduced to our kitchens in the 1920’s. Butcher block and stainless, even marble and zinc were all used in the preparation of meals in kitchens that were more about function and less about looks. In the 1980’s granite was high priced, and we thought we had finally found the ultimate countertop material with the introduction of Corian. Remember the advertisement boasting how surface scratches and burns could simply be lightly sanded to disappear? Since the 90's, the price of natural stone counters have come way down as the demand has caused a huge increase in the number of granite, marble, and soapstone slabs imported into our country, making them an affordable choice. Then quartz counters came on the scene, taking the appeal of the natural look of stone and some of the attributes of Corian a step further. In the past few years, the market has exploded with "look alike" quartz counters that resemble marbles and granites, with their veining and "movement". They appeal to those who want the look of natural stone with a little more homogeneity, as well as the low maintenance features that quartz counters provide. What exactly is engineered stone? 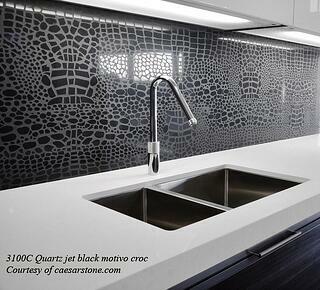 You may have heard of the various quartz-based countertops in play - Cambria, LG Viatera, CeasarStone, etc. These engineered materials are created through a manufacturing process that mixes approximately 90-95% ground natural quartz with polymer resins. The end result is an almost indestructible material that most manufacturers are willing to back with a warranty…something you will not find with natural stone. In most cases engineered stones will be very comparable to the cost of granite. Granite comes at various pricing levels, with most granites selected by our clients pricing out between $62 and $100 per sq ft, installed. There are also a range of "boutique granites" for special islands, or for "wow" kitchens that go from there up to $200 or even $300 per sq ft. The range for granite pricing is quite wide, and varies over time, since granite is a commodity. 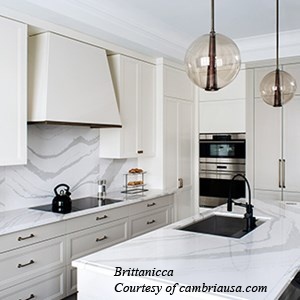 Buying a quartz counter is much simpler; for Cambria, most colors are one price. What are the visual differences? It has been said that kitchen counters are eye candy. We love to look at beautiful counters. One of the things that attracts us to natural stone in a kitchen is that, in nature, no two stones are equal. Every stone is different. In addition to the color variations, granite slabs are available with different surface finishes including honed and leathered as well as natural edges. However, because granite is natural, it’s not going to look the same throughout the entire slab. It might even look different from the sample you originally saw. The good news is that it’s always beautiful. It just might not be exactly what you expected. Some people don't like that element of the unknown. Others love the variability and enjoy the hunt for "the perfect slab". Quartz countertops are more consistent within each slab, and from slab to slab. The quartz manufacturers have replicated colors and patterns from nature, and gone beyond. For example, it's hard to get very white marble Carerra marble any more, and the quartz counter folks have nailed that look. Beyond that there are colors for everyone, include red, green, brown, and black. 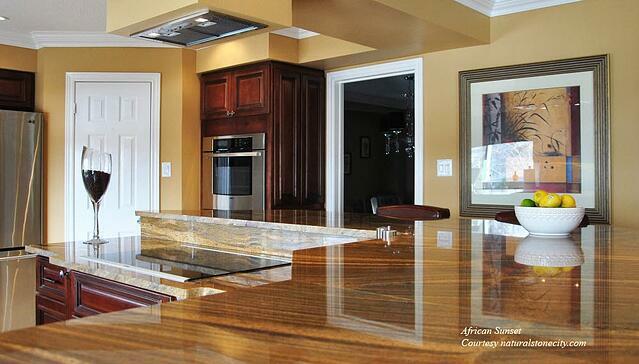 Some counters even have specks of glass or metal in them to add that granite-like appearance. The quartz counter manufacterers have taken the beauty of nature a step further! 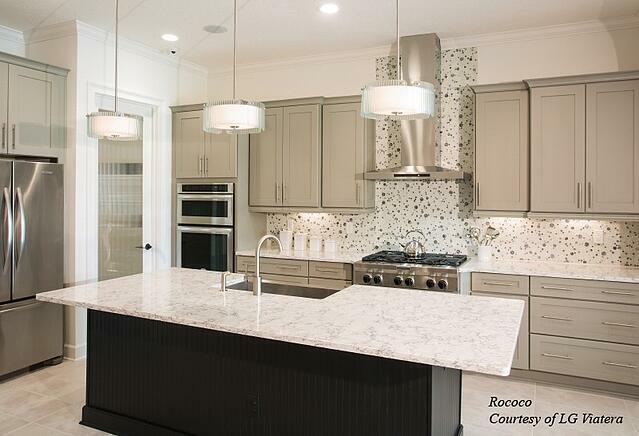 Quartz counters lend themselves to a variety of design styles and applications. CaesarStone, one of the pioneers of quartz-based products, offers embossed patterns like black crocodile and gem-like varieties such as Brown Agate showing there is no end to the design possibilities when you mix the best of nature with today’s technology and creativity. Like natural stone, quartz is sold in slabs. However, quartz slabs are often much larger than those available in natural stone; making it an excellent choice for those wishing to minimize seams in the kitchen, or where one large piece will be enough for an oversized island and seams can be avoided completely. Because a granite countertop is a single slab, there’s going to be a seam if your kitchen counters bend or curve. And because it’s natural rock, the seam isn’t easy to hide. It’s hard to match up the natural colors and veins in granite. Quartz seams are tighter, and with the solid colors, hardly noticeable at all. Both of these types of countertops are extremely durable. They are very strong and can last for many years to come. 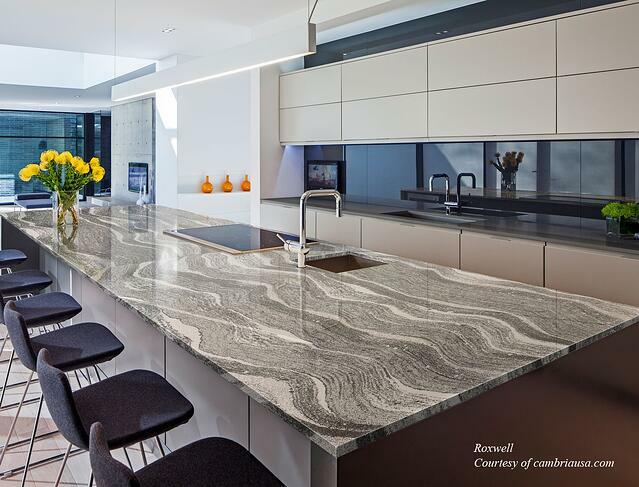 In terms of one-on-one for strength, quartz counters are stronger than granite, period. That's because quartz is the strongest stone not considered to be a gem. 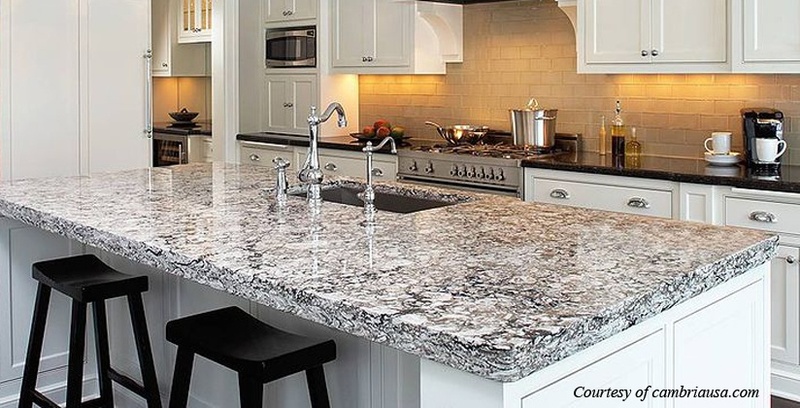 For example, the Cambria line is made up of 93% quartz while granite is only composed of 40% – 60% quartz. A granite countertop will have other impurities and softer minerals added. You’ll be able to count on it for years of service. Granite doesn’t break very easily or very often. If granite chips or cracks (which can happen if it is struck with a heavy object), it can be refinished or repaired with colored epoxies. The other thing that you need to be aware of when you’re questioning how quartz counters compare to granite countertops is that granite is a porous stone and if it is not sealed it can absorb food and liquids such as cooking oils and household cleaners. We use a 10 year sealer for the natural stone we provide, so the fact that a sealer is required is not typically a big factor in our clients' decision making. 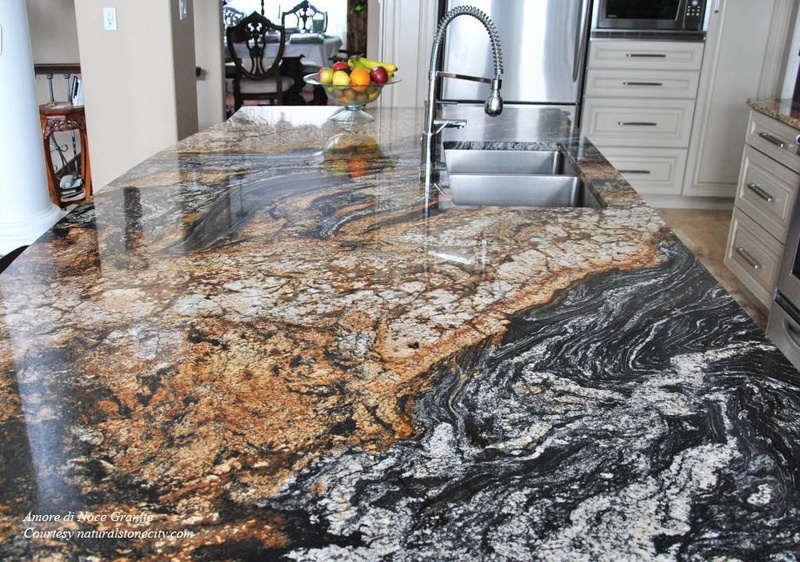 While the quartz-based counter folks tout granite's porosity as a health risk, records maintained by The Center for Disease Control confirm that there is absolutely no evidence of granite harboring bacteria or of anyone getting sick from bacteria in granite. Additionally, the National Institute for Occupational Safety and Health, as well as the Hospitality Industry, give granite a clean bill of health; granite is no more or less sanitary than any other surface. Both sealed granite and quartz-based countertops are scratch resistant. With both types of countertops you should be careful with them since they are resistant to scratches but not fully scratch-proof. In this regard, both of these countertops would be given the same top marks. Granite counters are heat resistant and can withstand the heat of hot pots and pans without damage. A negative for quartz counters is that exposure to excessive heat can compromise the quartz so you should avoid extended exposure to direct heat from pots and pans. Granite gets higher points for this one. How do we choose between quartz-based brands? We tend to choose between the brands based on the colors that we (and our clients) are looking for for a particular kitchen.Cambria, LG Viatera and CeaserStone all provide a quality product that we are proud to install. But there are in fact some differences between the companies and what makes each a stand out. Cambria is a family owned company with a 100% made-in-the-USA product that does not compromise on quality or customer service in any way. They sell only to a select group of partners, like us, who meet the installation standards required and offer premium service they are looking for from their partners. They pride themselves in using the best materials, and have a limited lifetime warranty. They have spent years building their reputation and evolving their product so that it is the best that they think it can be. They are a company that commits itself to doing everything possible to make sure that you are happy with the final product. 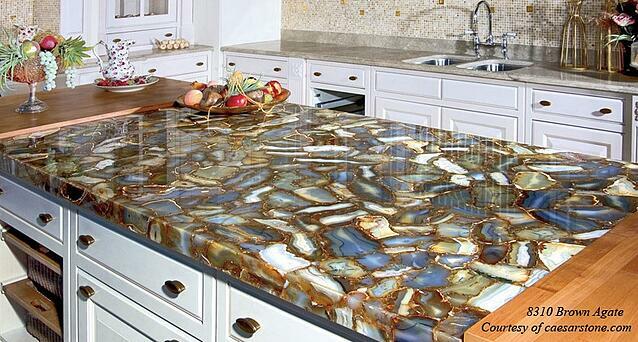 Check out the Cambria Design Palette. Setting a new benchmark for quartz surfacing products, CaesarStone has made a place for themselves on the map by being eco-friendly, and incorporating recycled materials. Their quartz slabs incorporate 17-42% first quality reclaimed quartz from the fabrication process (post-production recycled) and post-consumer recycled glass and mirrors. They also have a Lifetime warranty. Here are some CaesarStone color options. Our clients love the Viatera colors. They come both honed and polished. 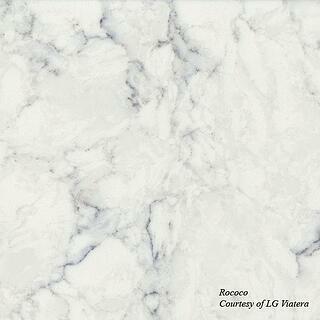 Viatera Quartz surfaces are proudly manufactured with care at LG's state-of-the-art facility in Adairsville, GA, USA. By keeping production resources near their end consumers, the distance the products need to ship is lessened, which reduces pollution, fuel consumption, and as result, their carbon footprint. They have a 15 year transferrable warranty. 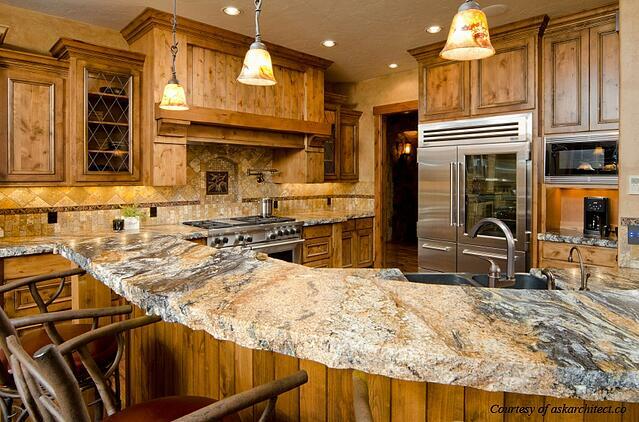 Granite is well loved and has long been the gold standard for kitchen counters. It's popular for resale, and is by no means on its way out the door in kitchen design. But quartz based counters have increased in market share as the manufacturers have come to offer a range of natural looking colors and patterns, in a low maintenance product. What's right for you? There's no right answer for everyone. Both quartz-based and granite counters are solid sensible choices. Look at them both, bring some samples home, let your eye and your gut guide you on which one you would like to welcome into your home.